An event is a post category that is associated with the calendar. Events are created using the same method as other posts, but before publishing them, one more step must be take. After creating your event, but before publishing it, scroll to the bottom of the page. 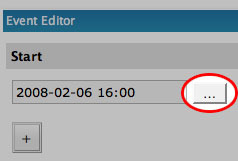 The last box is the Event Editor, click the “+” button to expand the Event Editor. Click this “+” button to add an event. 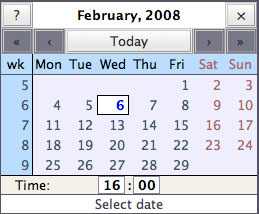 Click the button after the start date to open a calendar. Please be aware that in the Dashboard of your website, all times must be entered in 24 hour time. In the live published version, the time will be automatically converted to 12 hour time. You can choose an end date or time for your event, or check the “All Day” box. Other events may be added by clicking the “+” button below the start time again. When you are finished adding and configuring your event, you can scroll back up and click the “Publish” button. Event posts will included the time and date of the event. Events will be automatically added to the Event category and the calendar.